Average Weight	: 40 - 50 lbs. What does the United Kingdom, our U.S. Marines, Yale & the University of Georgia have in common? The Bulldog. Commonly called the English Bulldog the breed originated in England and has a bloody past. While they originated in the British Isles the Bulldog descended from the ancient Asiatic Mastiff. It descended from fighting Mastiffs that were brought to the British Isles by the Romans and were used in a bloody sport called bull-baiting. Today, however, the Bulldog only slightly resembles his ancestors in appearance. For all the ferociousness that they originally were bred for that is now gone for good...today you'd be hard-pressed to find a dog with a sweeter, more loving disposition. Bulldogs are never mistaken for other breeds. While medium in height they are broad, muscular and solid, low to the ground, and heavy. Their short-muzzled head is massive and square. They have broad shoulders and chests, with thick, sturdy limbs. Bulldogs have a droopy upper lip and his lower jaw tends to be undershot, meaning that his lower teeth stick out farther than his top teeth. The Bulldog's jaws are massive and strong, bred to latch on to his opponent and hold on. Their name, of course, derives for the fact that they were used in bull baiting as well as a resemblance to looking like a small bull. Originally bred to be aggressive, ferocious and courageous with the power to attack full grown bulls, which they did in arena combat before the practice was banned by law in the 19th century. •	The Bulldog is becoming more and more popular in the USA but is not a dog for everyone. •	Wheeze, snore & snort. Can develop sleep apnea. & respiratory ailments. •	Bulldogs will over-eat if allowed. You must monitor their intake of food. •	Heavy in size, they aren't easy to pick up. •	Tend to be inactive, preferring to eat, sleep and eat again: ~ great for your computer geeks! •	They do need exercise though to keep their weight down. •	Bulldogs are Kind and affectionate. •	Clearly, Bulldogs have a calm dignity, strong front appearance about them. •	Can be stubborn and lazy yet when called upon can be protective of their families. •	These noble dogs love people. •	Do not tolerate heat or humidity well & sensitive to cold weather climates. •	Bulldogs prefer to be an indoor, house dog ~ do not do well living outdoor. •	If you're thinking of breeding, this breed has difficulty and often need caesarean deliveries, that can be very costly. The English Bulldog is known for being a very serious, devoted and loyal breed of dog. They are a very attention-seeking dog and are not considered appropriate for homes where they would be left alone for extended periods of time. This breed was bred as a companion dog, and really does desire and require constant attention from its owners. The breed is typically a very calm and well-behaved dog, although they are considered a dominant breed and must learn that the humans are in charge in the household. The English Bulldog will bond very strongly with its family, and often has difficulty in re-homing after that bond has been established. Our distinctive English Bulldog loves to please, and will quickly learn what the owners are requiring of it. Highly intelligent, they do best with some repetitive training but also lots of variation. They are an excellent companion dog for both other dogs as well as non-canine pets. Proper socialization is important with this breed, as they can be somewhat dog-aggressive, especially the intact males. Neutering and training, as well as constant interaction with other dogs, can prevent this from becoming problematic. Most English Bulldogs make wonderful pets for families with younger or older children, and the breed has a natural patience with children and the elderly. A slow moving breed, they are not ideal for kids that want a pet that is running with them all day, but they are very loyal, loving and protective of children. English Bulldogs have a unique temperament. People can mistake their often slow response to commands as laziness, but those that know the Bulldog breed know that the dogs like to consider the command before simply jumping up and doing it. A problem solver, the Bulldog likes a mental challenge, and will approach new activities and events in a thoughtful and consistent manner. They are very good travelers, and typically love to go for a ride in the car. As with most Bulldogs this breed is a natural protector of the home and property. While not a problem barker, they will let you know when strangers approach. Their appearance is often enough to warn off intruders, but the Bulldog will use its strength to defend its property if required. It is very important to closely monitor a Bulldog whenever anesthesia is being used, as they can easily have significant and serious respiratory complications. The short and very smooth coat of the English Bulldog is very easy to care for on a regular basis. A stiff bristle brush is all that is needed to gently groom the dog two or three times per week. It is important to keep the skin folds on the face, neck and tail carefully cleaned with a damp cloth to remove any debris and dead hair that may become trapped. This debris can cause irritations, leading to lesions and other infections in the folds of the skin. When cleaning the folds, be sure to wipe first with a slightly damp cloth then follow with a soft towel or dry cloth. Never leave the folds wet or use any type of soap or cleanser, as this can cause irritations and potential allergic reactions. The English Bulldog should only be bathed when required, and never frequently. Bathing too often will dry out the skin and can lead to itchy, flaky and irritated skin. A soft, damp cloth can be used to gently and easily wipe down the dog should he or she become muddy or dirty. Check the nails regularly, and clip to keep them short and free from splinters or sharp points. The teeth can routinely be brushed using a finger sleeve or dog toothbrush and toothpaste. The English Bulldog is considered an average shedder, and does not shed seasonally. 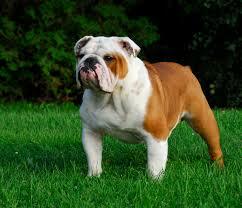 The Bulldog, while square and rather squat, is still a very active dog when provided with regular exercise. Since they are prone to rapid weight gain and some obesity, regular walks and opportunities to get out and about are very important with this breed. Naturally very sedate, an English Bulldog is not good at self-exercising, and may need some prompting to move about and exercise. They are fast for their size and shape over short distances, and many English Bulldogs will play and romp for short periods with other dogs given the opportunity. They are equally accepting of longer, more sedate walks. An English Bulldog should never be exercised in very hot or cold conditions. In cold conditions, the Bulldog's short coat will provide little if any protection to the temperatures, and in hot conditions their brachiocephalic or short muzzle head formation will lead to overheating and heatstroke very quickly. Only exercise in the coolest times of the summer months, and provide lots of shade and water for these dogs if they are being left outdoors. While not a playful breed when full grown, they are very playful as puppies. Some of the adult Bulldogs retain a more playful attitude even as they mature, but this is not considered typical of the breed. The English Bulldog requires an owner that understands how to work with a dominant breed of dog. This is critical, as owners that don't understand how to positively and appropriately teach the dog that they are not the boss will soon have a dog that simply does what he or she wants, rather than listening and obeying commands. The owner must establish that he or she is the "alpha dog" or leader in positive and gentle ways, without punishing or harshly treating the dog. A Bulldog is very sensitive to punishment, and will rarely be intentionally disobedient once they have outgrown their puppy stage. Occasionally some Bulldogs will be stubborn and difficult to train, and a puppy obedience class is highly recommended for the breed. An English Bulldog is a very intelligent breed and is a thoughtful dog, not typically jumping into new situations or activities without giving them some consideration. Since the older the Bulldog gets the slower it tends to move, it is important to keep in mind that this dog will take a few seconds or more to respond to a command. In addition, the Bulldog likes to contemplate his or her options before jumping up to respond to a command. They are not a dog that does something on the spur of the moment; rather they seem to study the situation before deciding what action to take. A Bulldog does best with repetitive training in very short time frames, rather than one long training session. Typically, they love to please their owners, and will work very well for praise as well as treats and rewards. Limit food rewards, as the breed has a tendency for rapid weight gain. A well-trained and well-socialized English Bulldog is an excellent companion dog. The natural protective instincts of the breed mean that they require little training to become expert watchdogs. Typically the English Bulldog has few destructive behaviors, although chewing can occasionally become a problem if they are not provided enough attention. They can be somewhat dog-aggressive with strange dogs, so ensure proper socialization at an early age. Most English Bulldogs get along well with cats and other pets, and socialization will increase these positive attributes as well.